During my first meeting with Jennifer and Jasmin, the Official Philippine AmbassadOREOS, we were talking about the the places I wanted to eat at New York. As you can imagine, a free trip to New York is every person's dream come true (unless of course, you live in New York), so imagine what it felt like to be a food blogger, planning a trip to one of the greatest food cities on the planet. 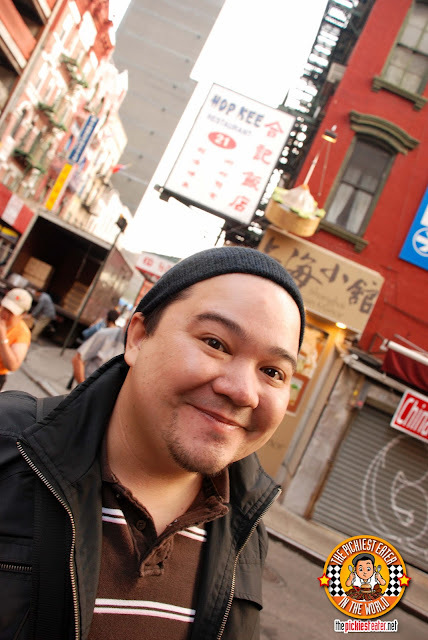 My goal when going to New York was making sure that I would try some of the delicious hot spots I had seen on some of some of my favorite food shows that I had watched in the past. During our conversation, the twins told me, "Oh, please reserve one dinner for us! Our parents are taking us to Hop Kee!". The name "Hop Kee" instantly rang a bell, but I couldn't place it. Hey, it was a free meal so I wasn't going to say no to that. It was only after we had eaten did I realize where I heard the name "Hop Kee" before..
From a little show called "Anthony Bourdain: No Reservations". One thing's for sure.. Hop Kee will most certainly not win any awards for best interior design. The place is very simple.. With a drab 80's feel to it. It's practically just someone's empty basement that someone wall papered, cleaned up, put some tables in. 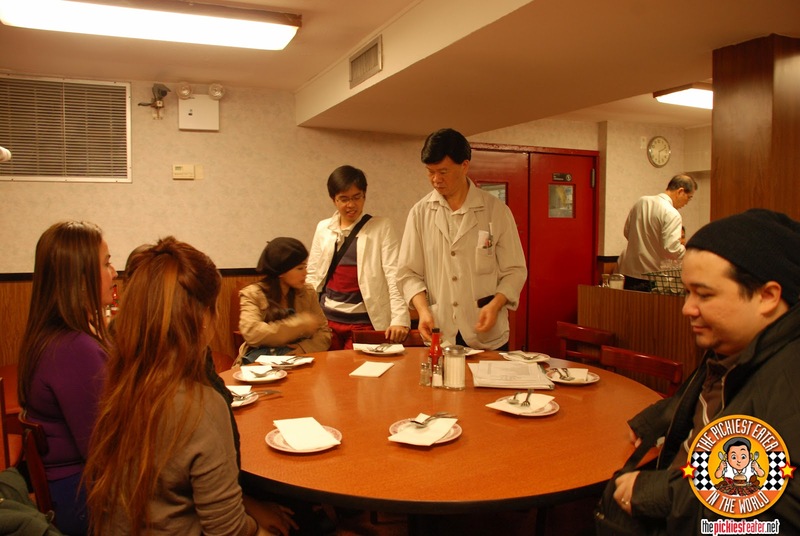 I wanted to experience a New York Hole-In-The-Wall restaurant, and by George, I found it! 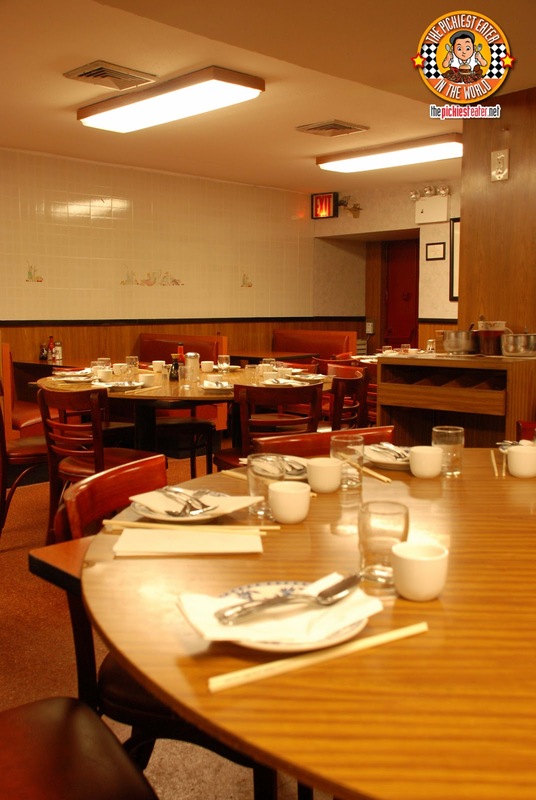 Hop Kee is right along Mott St., in the heart of New York's Chinatown, and is one of the most popular authentic Cantonese restaurants in the area. Hop Kee is famous among Chinese nationals, because of its Secret Menu, that features old school favorites, that doesn't really cater to the American market. The important part to note, as simple as the decors were, the place was quite clean. Tables were efficiently bused out as soon as customers left, although the Restroom, admittedly, could have used a bit more mopping, but as a whole, I thought it was ok.
To me, I was just excited to be eating at an authentic Cantonese restaurant in New York that Anthony Bourdain had set food in, so I wasn't really concerned with cleanliness anymore. 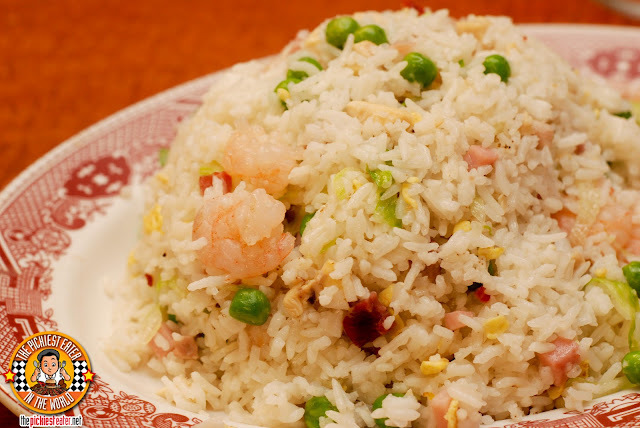 For me, every delicious Chinese meal must start with Yang Chow Fried Rice (US$8.25). Plain rice in a Chinese restaurant is just plain wrong. My boss used to order all these highfalutin Chinese dishes and tell the waitress, "just give us plain rice, para malasahan namain yung pagkain (So we can taste the flavors of the food)". I always found that ridiculous. Of course I couldn't speak up because A) he's my boss, and B) he was paying for the bill, nonetheless I still found it rather strange. 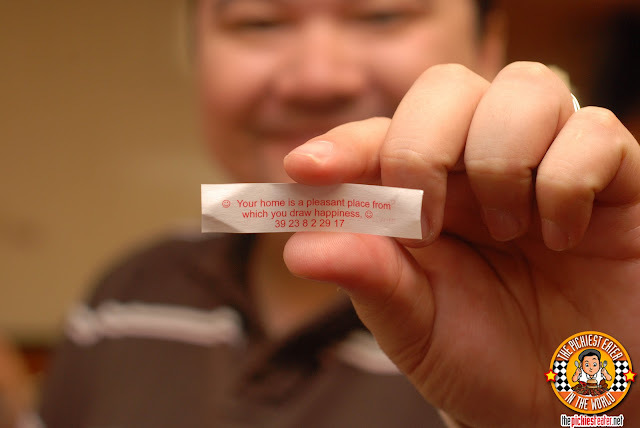 Yang Chow rice, or any Chinese fried rice for that matter, is a Chinese restaurant staple, and to me, is as important as the entrees. And yes, Hop Kee's Yang Chow was delicious. It was just flavor in it to compliment your meal, without overpowering it. 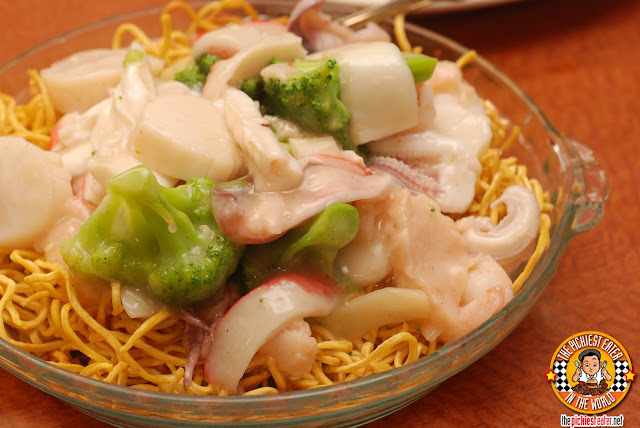 The Seafood Cantonese Chow Mein (US$ 18.50) had a combination of fresh seafood, mixed into a thick, sauce, and laid out on a bed of crunchy noodles. As the thick, almost gloopy sauce is absorbed by the noodles, it softens it, making it easier to eat, however it tastes good crunchy as well! Even when we were still in Manila, Jasmin was a woman on a mission. 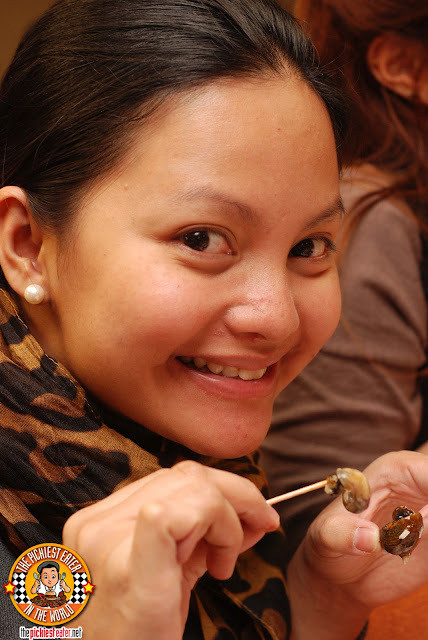 Her goal was to eat as many Cantonese Style Snails (US$ 15.25) from Hop Kee as she could, because she didn't know when she'd be able to go back to New York for them. And trust me, one platter of these bad boys was not enough for her. 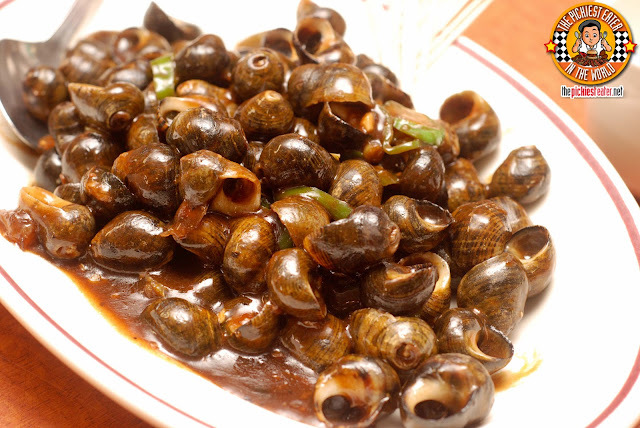 I wouldn't be the picky eater that I am if I ate something as disgusting as snails, right? So I had Rina try it.. and she actually enjoyed it! I dunno.. it looked like something out of Ridley Scott's "Alien", so I just couldn't get myself to try it.. besides.. Jasmin and the others were so busy enjoying it, I thought sacrificing my share would be the gentleman thing to do.. Also I was saving my stomach space for other things like..
.. 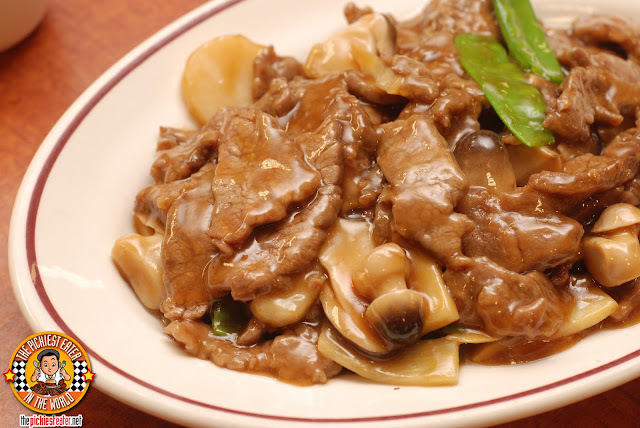 The Beef with Chinese Mushrooms (US$13.75). The thin slices of beef were amazingly tender, and the the thick sauce it was bathed in just filled it even more with flavor. 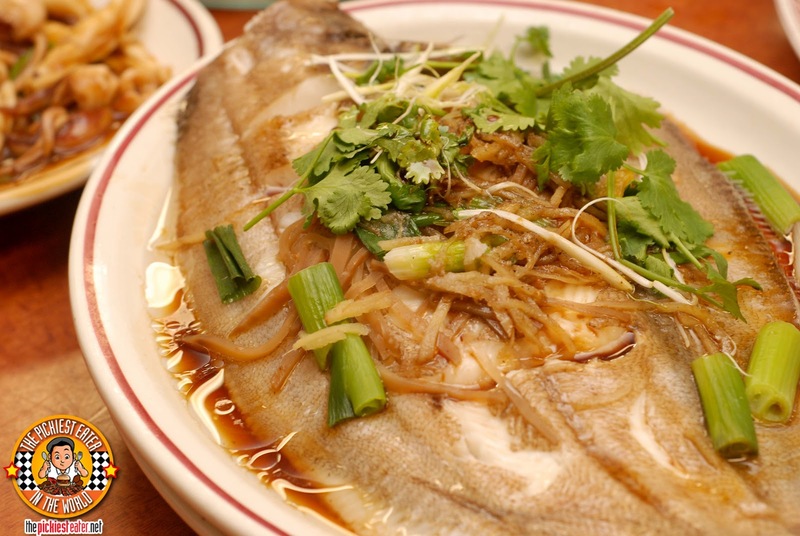 Something that I found really good was the Pan fried flounder (US$19.95). The fish was very fresh, and tasty, with the spring onion and shreddded ginger garnish helped bring out the flavor of the fish. However, it was the light soy sauce that really made this an amazing dish. Lightly sweet, with the perfect amount of saltiness, this one really left a mark with me. Hop Kee Fried Chicken (US$14.75) was the classic, Chinese Style Fried chicken that I absolutely love. I'll admit, Hop Kee's version is better than Savory's version (Although I love Savory too, mind you), as it was incredibly juicy and tasty. I don't usually eat white meat, but I found myself tearing pieces even the breast part like it was a thigh! 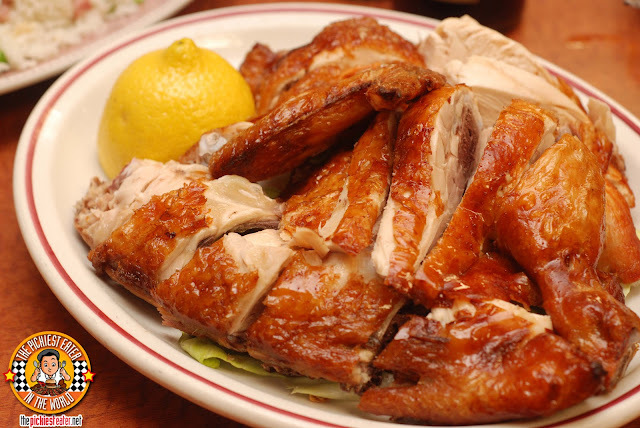 The skin was cooked to a perfect golden crisp, without compromising the moisture of the chicken meat. Something that I found myself eating a great deal of, was the Pork Chop Peking Style (US$12.95). 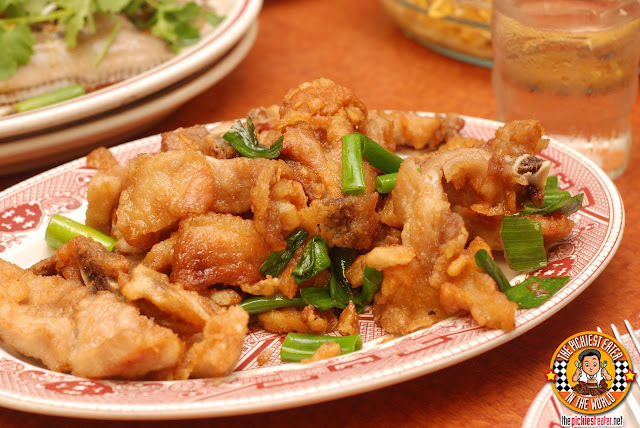 It was a simple dish.. Lightly coated chopped pork chop, and deep fried with green onion and other spices. It was a little reminiscent of North Park's Double Pork Rib.. But since North Park's Dish is in my hall of fame.. I have to admit, I enjoy the Double Pork Rib more. That doesn't mean to say I didn't enjoy this though, because I really did. But I can't help but think how much better this would be if it had some sort of dip.. Sort of like what I do with the Siopao sauce at North Park. We were all done eating, but Jasmin was still going at the snails! from the movie "300" hehe..
For such a tiny little lady, dang that girl can eat! I enjoyed my first dinner in New York.. Hop Kee was an excellent place to start! There were so many other items on their menu that I wanted to try, like their sweet and sour pork, and their BBQ Ribs, but of course, I was just a guest so I was a bit shy to order on my own (Although our gracious hosts encouraged us to order whatever we wanted). My dinner reaffirmed something I was thinking for quite some time now.. When It comes to Chinese cuisines, the Philippines can stand toe to toe with some of the best the world has to offer. What a great way to start our New York Adventure! This was only the first of what would be my night of Three Dinners? 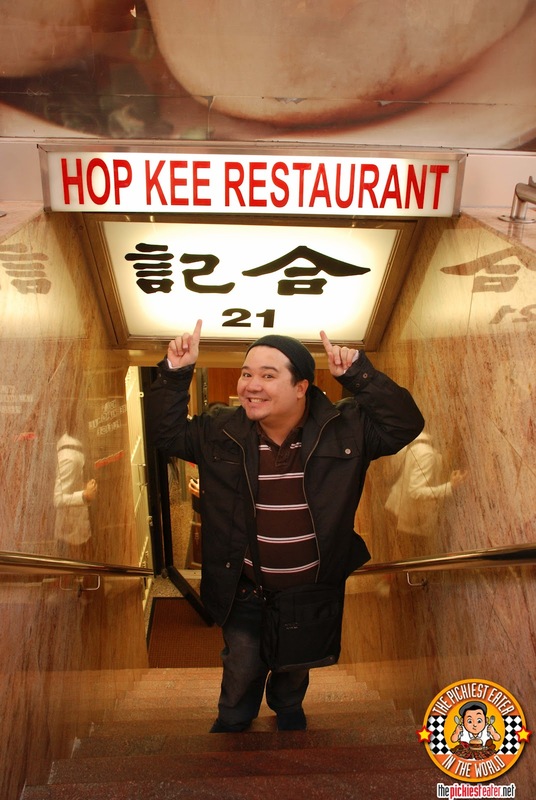 Oh, and this is the episode of No Reservations where Hop Kee came out! Thanks bro! we had a blast! I think there should be a 11th commandment: Thou shall not doubt Mr. Bourdain's taste in food. :) I haven't tried snails, ever. But maybe I'll try a piece or two. Thanks guia! expect a whole month of NY posts! awww I wish I did!!!! Hope you get to visit there too, Justinne!! Its a food lover's paradise.. I guarantee you'll have a blast!! haha we miss you Jas! Finally your NY post!! uggh, the fish looks really great..sadly there's no cute baby rain included in your pics for the mean time..aww :(( . 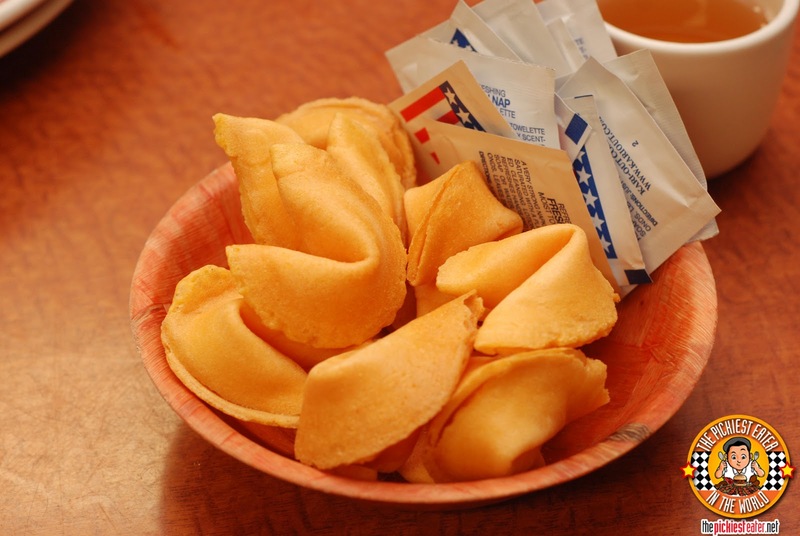 I want a Fortune Cookie now! haha thanks Jill!! Can't wait for your posts on Maskara! I dream of going to NY again and eating here... also a falafel from a falafel cart ("No MORE FALAFEL FOR YOU!"... from??)... he he he he! Haha our hotel was right beside the famous Halal food cart but we weren't able to go because the lines were always so ridiculously long!